As can be seen on the Insolvency Service’s dedicated RPB-monitoring web-page – https://www.gov.uk/government/collections/monitoring-activity-reports-of-insolvency-practitioner-authorising-bodies – their efforts to review systematically each RPB’s regulatory activities seemed to grind to a halt a year ago. The Service did report last year that their “future monitoring schedule” would be “determined by risk assessment and desktop monitoring” and they gave the impression that their focus would shift from on-site visits to “themed reviews”. Although their annual report indicates that such reviews have not always been confined to the desk-top, their comments are much more generic with no explanation as to how specific RPBs are performing – a step backwards, I think. An example of this opacity is the Service’s account of their themed review “into the activities, and effectiveness, of the regulatory regime in monitoring fees charged by IPs”. After gathering and reviewing information from the RPBs, the InsS reports: “RPBs responses indicate that they have provided guidance to members on fee matters and that through their regulatory monitoring; fee-related misconduct has been identified and reported for further consideration”. For this project, the InsS also gathered information from the Complaints Gateway and has reported: “Initial findings indicate that fee related matters are being reported to the IP Complaints Gateway and, where appropriate, being referred to the RPBs”. Ohhhkay, so that describes the “activities” of the regulatory regime (tell us something we don’t know! ), but how exactly does the Service expect to review their effectiveness? The report states that their work is ongoing. Don’t get me wrong, it’s not that I necessarily want the Service to dig deeper. For example, if the Service’s view is that successful regulation of pre-packs is achieved by scrutinising SIP16 Statements for technical compliance with the minutiae of the disclosure checklist, I dread to think how they envisage tackling any abusive fee-charging. It’s just that, if the Service thinks that they are really getting under the skin of issues, personally I hope they are doing far more behind the scenes… especially as the Service is surely beginning to gather threads on the question of whether the world would be a better place with a single regulator. How frequently are you receiving monitoring visits? There is a general feeling that every IP will receive a monitoring visit every three years. But is this the reality? This shows quite a variation, doesn’t it? For two years in a row, significantly less than one third of all IPs were visited in the year. Does this mean the RPBs have been slipping from the Principles for Monitoring’s 3-year norm? The spiky CAI line in particular demonstrates how an RPB’s visiting cycle may mean that the number of visits per year can fluctuate wildly, but how nevertheless the CAI’s routine 3-yearly peaks and troughs suggest that in general that RPB is following a 3-yearly schedule. So what picture do we see, if we iron out the annual fluctuations? This looks more reasonable, doesn’t it? 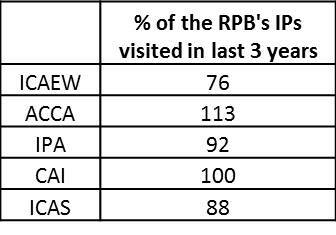 As we would expect, most RPBs are visiting not-far-off 100% of their IPs over three years… with the clear exceptions of CAI, which seems to be oddly enthusiastic, and the ICAEW, which seems to be consistently ploughing its own furrow. 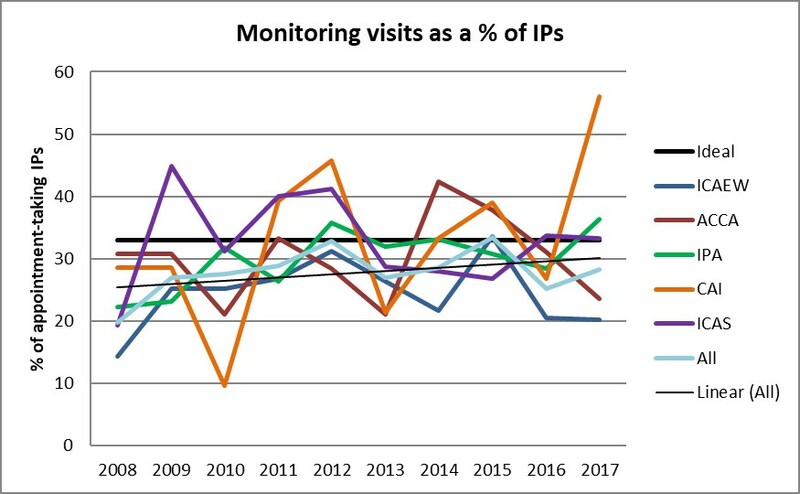 This may be the result of the ICAEW’s style of monitoring large firms with many IPs, where each year some IPs are the subject of a visit, but this may not mean that all IPs receive a visit in three years. Alternatively, could it mean they are following a risk-based monitoring programme..? There are benefits to routine, regular and relatively frequent monitoring visits for everyone, almost irrespective of the firm’s risk profile: it reduces the risk that a serious error may be repeated unwittingly (or even deliberately). However, this model isn’t an indicator of Better Regulation (see, for example, the Regulators’ Compliance Code at https://www.gov.uk/government/publications/regulators-compliance-code-for-insolvency-practitioners). With the InsS revisiting their MoU (and presumably also the Principles for Monitoring) with the RPBs, I wonder if we will see a change. The alternative to the one-visit-every-three-years-irrespective-of-your-risk-profile model is to take a more risk-based approach, to spend one’s monitoring efforts on those that appear to be the highest risk. This makes sense to me: if a firm/IP has proven that they are more than capable of self-regulation – they keep up with legislative changes, keep informed even of the non-legislative twists and turns, and don’t leave it solely to the RPBs to examine whether their systems and processes are working, but they take steps quickly to resolve issues on specific cases and across entire portfolios and systems – why should licence fees be spent on 3-yearly RPB monitoring visits, which pick up non-material non-compliances at best? Should not more effort go towards monitoring those who seem consistently and materially to fail to meet required standards or to adapt to new ones? But perhaps that’s what being done already. Are many targeted visits being carried out? It seems that for several years few targeted visits have been conducted, although perhaps the tide is turning in Scotland and Ireland. The ACCA also performed a number, although now that the IPA team is carrying out monitoring visits on ACCA-licensed IPs, I’m not surprised to see the number drop. 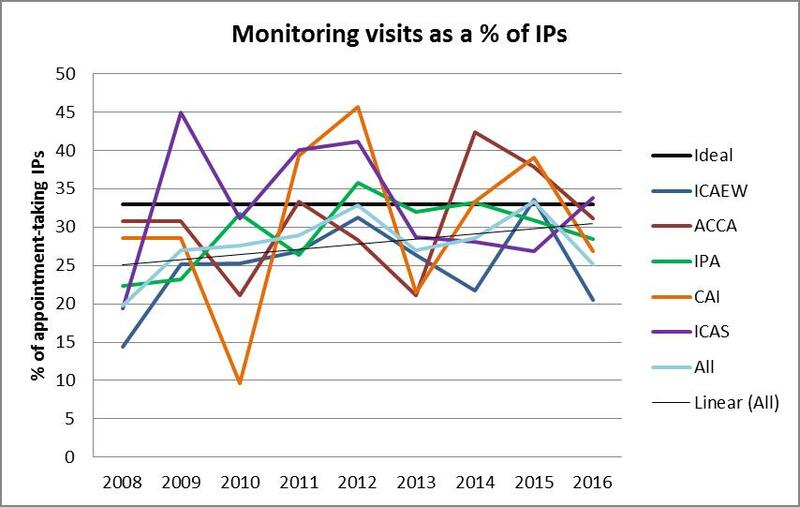 I think this demonstrates that the ICAEW isn’t lightening up: they may be carrying out less frequent monitoring visits on some IPs, but their post-visit actions are by no means infrequent. So perhaps this indicates that the ICAEW is focusing its efforts on those seriously missing the mark. The ICAEW’s preference seems to be in requiring their IPs to carry out ICRs. Jo’s and my experiences are that the ICAEW often requires those ICRs to be carried out by an external reviewer and they require a copy of the reviewer’s report to be sent to the ICAEW. They also make more use than the other RPBs of requiring IPs to undertake/confirm that action will be taken. I suspect that these are often required in combination with ICR requests so that the ICAEW can monitor how the IP is measuring up to their commitments. And in case you’re wondering, external ICRs cost less than an IPA targeted visit (well, the Compliance Alliance’s do, anyway) and I like to think that we hold generally to the same standards, so external ICRs are better for everyone. In contrast, the IPA appears to prefer referring IPs for disciplinary consideration or for further investigation (the IPA’s constitution means that technically no penalties can arise from monitoring visits unless they are first referred to the IPA’s Investigation Committee). However, the IPA makes comparatively fewer post-visit demands of its IPs. But isn’t that an unfair comparison, because of course the ICAEW carried out more monitoring visits in 2017? What’s the picture per visit? No better and no worse? Hmm… I’m not sure this graph helps us much. 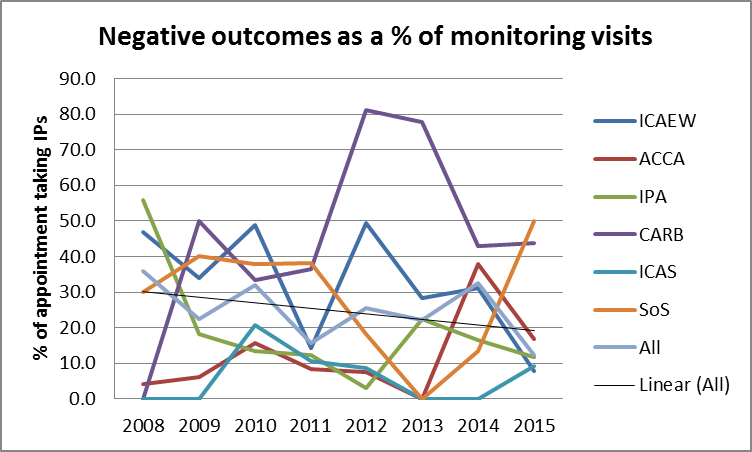 Inevitably, the negative outcomes from monitoring visits are spiky. We’re not talking about vast numbers of RPB slaps here (that’s why I’ve excluded the smaller RPBs – sorry guys, nothing personal!) and the “All” line (which does include the other RPBs) does illustrate a smoother line overall. 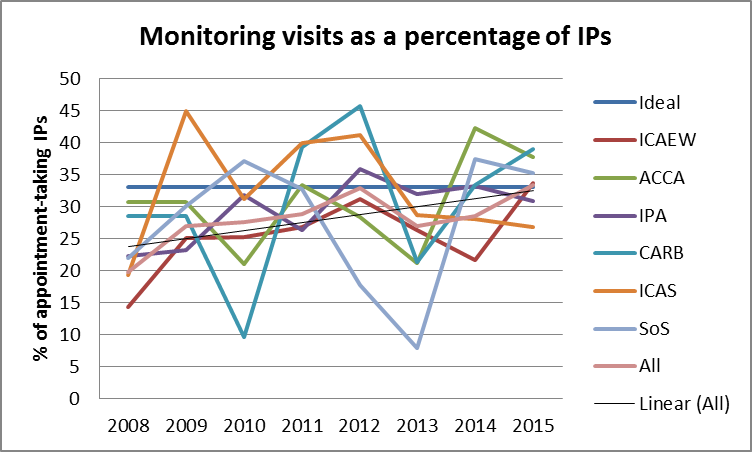 But the graph does suggest that ICAEW-licensed IPs are over three times as likely to receive a negative outcome from a monitoring visit than IPA-licensed IPs. Before you all get worried about your impending or just-gone RPB visit, you should remember that a single monitoring visit can lead to more than one negative outcome. For example, as I mentioned above, the RPB could instruct an ICR or targeted visit as well as requiring the IP to make certain undertakings. One would hope that much less than 25% of all IPs visited last year had a clean outcome! This doubling-up of outcomes may be behind the disparity between the RPBs: perhaps the ICAEW is using multiple tools to address a single IP’s problems more often than the other two RPBs… although why should this be? Alternatively, perhaps the ICAEW’s record again suggests that the ICAEW is focusing their efforts on the most wayward IPs. I observed in my last blog (https://tinyurl.com/y8b4cgp7) that the complaints outcomes indicated that the IPA was far more likely to sanction its IPs over complaints than the ICAEW was. I suggested that maybe this was because the IPA licenses more than its fair share of IVA specialists. Nevertheless, I find it interesting that the monitoring outcomes indicate the opposite: that the ICAEW is far more likely to sanction on the back of a visit than the IPA is. Personally, I prefer a regime that focuses more heavily on monitoring than on complaints. Complaints are too capricious: to a large extent, it is pot luck whether someone (a) spots misconduct and (b) takes the effort to complain. As I mentioned in the previous blog, the subjects of some complaints decisions are technical breaches… and which IP can say hand-on-heart that they’ve never committed similar? 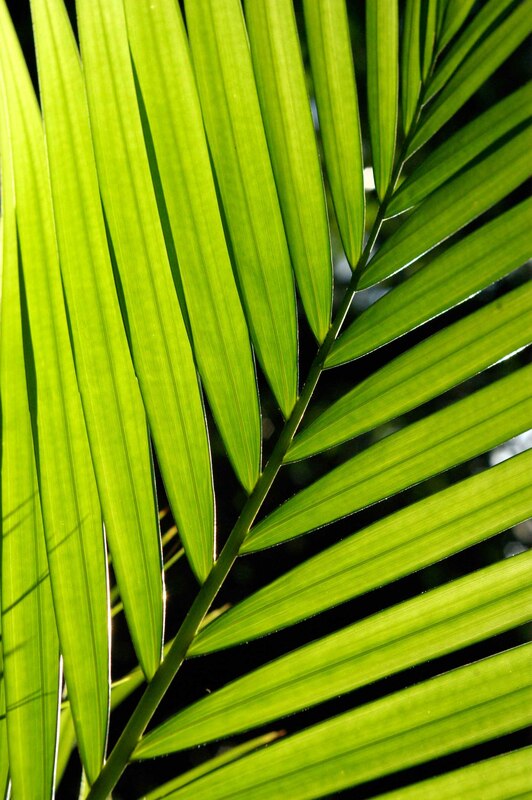 Also by their nature, complaints are historic – sometimes very historic – but it might not matter if an IP has since changed their ways or whether the issue was a one-off: if the complaint is founded, the decision will be made; the IP’s later actions may just help to reduce the penalty. In my view, the monitoring regime is far more forward-looking and much fairer. Monitors look at fresh material, they consider whether the problem was a one-off incident or systemic and whether the IP has since made changes. The monitoring process also generally doesn’t penalise IPs for past actions, but rather what’s important are the steps an IP takes to rectify issues and to reduce the risks of recurrence. The process enables the RPBs to keep an eye on if, when and how an IP makes systems- or culture-based changes, interests that are usually absent from the complaints process. Next blog: SIP16, pre-packs and other RPB pointers. Categories: Insolvency Service | Tags: Better Regulation, ICR, insolvency service, monitoring, RPBs, targeted visits | Permalink. 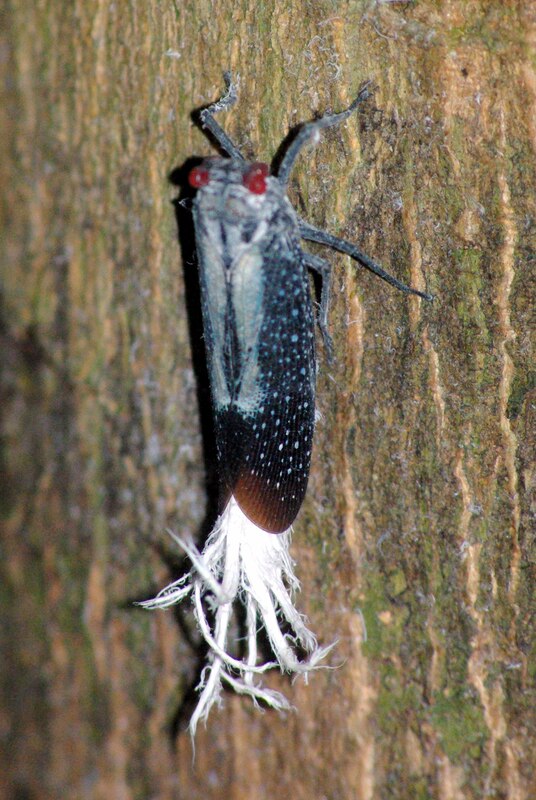 The report can be found at https://goo.gl/Jkwz19. The Review reveals another drop in the number of appointment-taking IPs. In fact, there was the same number on 1 January 2017 as there was on the same day in 2009: 1,303. 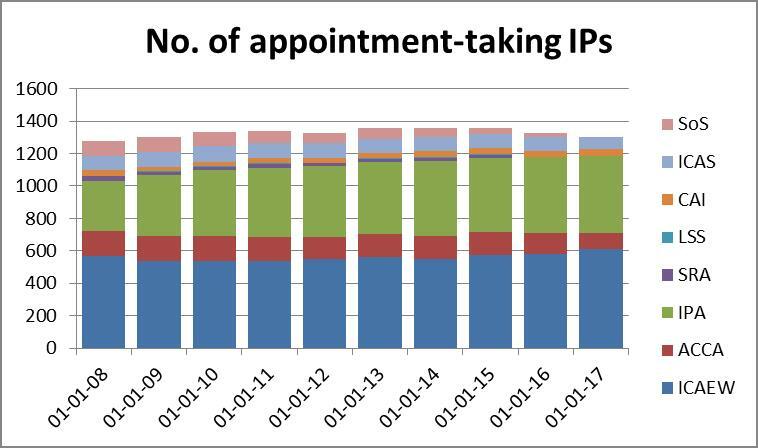 Is it a surprise that the number of appointment-taking IPs has dropped again? The 2016 insolvency statistics show modest increases in the numbers of CVLs and IVAs compared with 2015 and of course there was a bumper crop of MVLs in early 2016. Why is it that fewer IPs seem to be responsible for more cases? My hunch is that the complexity of cases in general is decreasing and I suspect that the additional hurdles put in place as regards fees have encouraged IPs to look at efficiencies, to create slicker processes, and to be more risk-averse, less inclined to go out on a limb with the result that some cases are despatched more swiftly and require less IP input. I also suspect the IP number for next January will show another drop. The expense and effort to adapt to the 2016 Rules will make some think again, won’t it? 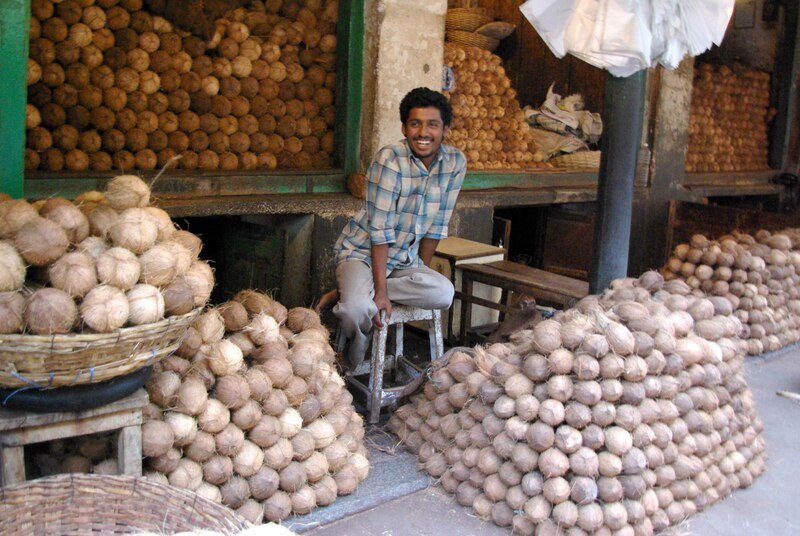 Does the presence of the regulators breathing down one’s neck erode IPs’ keenness to remain in the profession? How worried should IPs be about the risk of a regulatory sanction? The RPBs seem to have shown varying degrees of enthusiasm when it comes to taking regulatory action. To me, this hints at regulatory scrutiny of a different kind. Is it coincidental that the ACCA issued proportionately far more sanctions than any other RPB last year? Could the Insolvency Service’s repeated monitoring visits to the ACCA over 2015 and 2016 have had anything to do with this spike? What are behind these sanctions? Are they generated from the RPBs’ monitoring visits or from complaints? Last year, I observed that for the first time RPBs’ investigations into complaints had generated more sanctions than their monitoring visits. Regulatory actions in 2016 returned to a more typical pattern. Does this reflect a shifting RPB behaviour or is it more a result of the number of complaints received and/or the number of monitoring visits undertaken? Well, no wonder there were fewer disciplinary actions on the back of complaints: the RPBs received 28% fewer complaints in 2016 than they did in 2015. Why is this? Is it because fewer complaints were made? 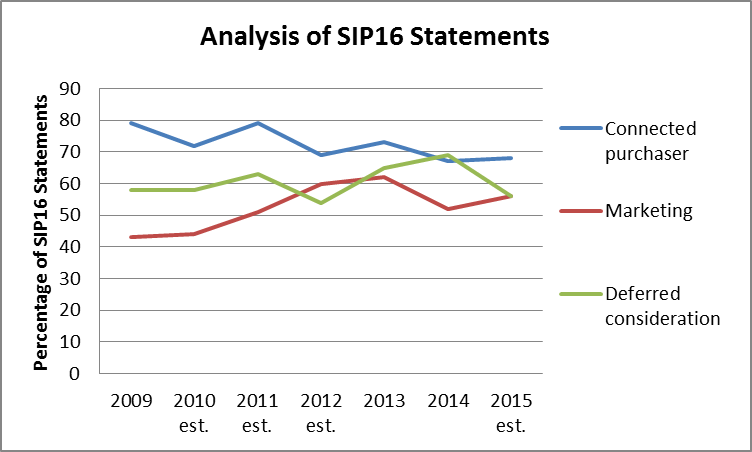 Undoubtedly, IVAs have generated a flood of complaints in recent years not least because of the issues surrounding ownership of PPI claims, but those issues were still live in 2016, weren’t they? Yes, it looks like IVAs continued to be contentious last year, although perhaps the worst is over. It seems, however, that the most significant drop has been felt in complaints relating to bankruptcies and liquidations. The reduction in bankruptcy complaints is understandable, as the numbers of bankruptcies have dropped enormously over the past few years, but liquidation numbers have kept reasonably steady, so I am not sure what is going on there. But are fewer people really complaining or is there something else behind these figures? An effective Complaints Gateway sift? When the Complaints Gateway was set up in 2014, it was acknowledged that the Insolvency Service would ensure that complaints met some simple criteria before they were referred to the RPBs. There must be an indication of a breach of legislation, SIP or the Code of Ethics and the allegations should be capable of being supported with evidence. Where this is not immediately apparent, the Service seeks additional information from the complainant. The graphs above are based on the complaints referred to the RPBs, so what is the picture as regards complaints received before the sifting process occurs? 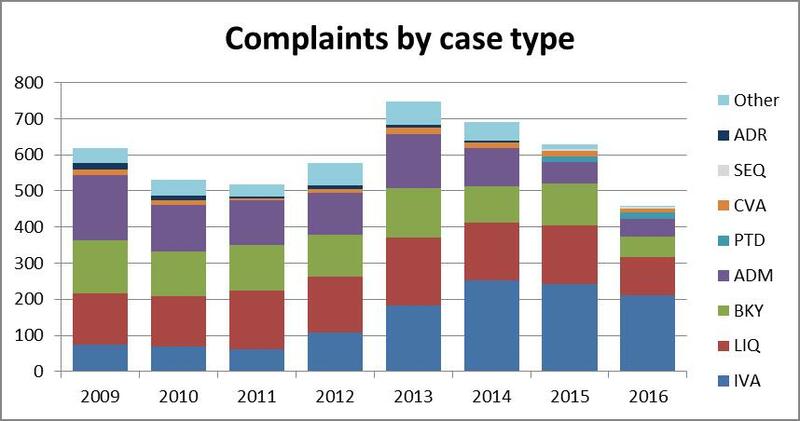 This shows that the Complaints Gateway sifted out more complaints last year: the percentage rejected rose from 25% in 2014, to 27% in 2015, to 29% in 2016. The Insolvency Service’s review explains that in 2016 a new criterion was added: “Complainants are now required in the vast majority of cases to have raised the matter of concern with the insolvency practitioner in the first instance before the complaint will be considered by the Gateway”. This is a welcome development, but it did not affect the numbers much: it resulted in only 13 complaints being turned away for this reason. But this rejected pile is not the whole story. The graph also demonstrates that a significant number of complaints – 144 (17%) – were neither rejected nor referred last year, which is a much larger proportion than previous years. Presumably these complaints are being held pending further exchanges between the Service and the complainant. Personally, I am comforted by this demonstration of the Service’s diligence in managing the Gateway, but I hope that this does not hint at a system that is beginning to get snarled up. How many complaints led to sanctions? When I looked at the Insolvency Service’s review last year, I noted that the IPA’s sanctions record appeared out of kilter to the other RPBs. It is interesting to note that 2016 appears to have been a more “normal” year for the IPA, but instead the ACCA seems to have had an exceptional year. As mentioned above, I wonder if the Insolvency Service’s focus on the ACCA has had anything to do with this unusual activity (I appreciate that 2010 was another exceptional year… and I wonder if the fact that 2010 was the year that the Insolvency Service got heavy with its SIP16-reviewing exercise had anything to do with that particular flurry). The obvious conclusion to draw from this graph might be that an ACCA-licensed IP has a 1 in 3 chance that any complaint will result in a sanction. However, perhaps these IPs can rest a little easier, given that the ACCA’s complaints-handling is now being dealt with by the IPA. What about sanctions arising from monitoring visits? How do the RPBs compare on that front? These percentages look rather spectacular, don’t they? It gives the impression that on average almost one third of all monitoring visits result in some kind of negative outcome… and it appears that 90% of all the CAI’s monitoring visits gave rise to a negative outcome! Well, not quite. It is likely that some monitoring visits led to more than one black mark, say a plan for improvement and a targeted visit to review how those plans had been implemented. 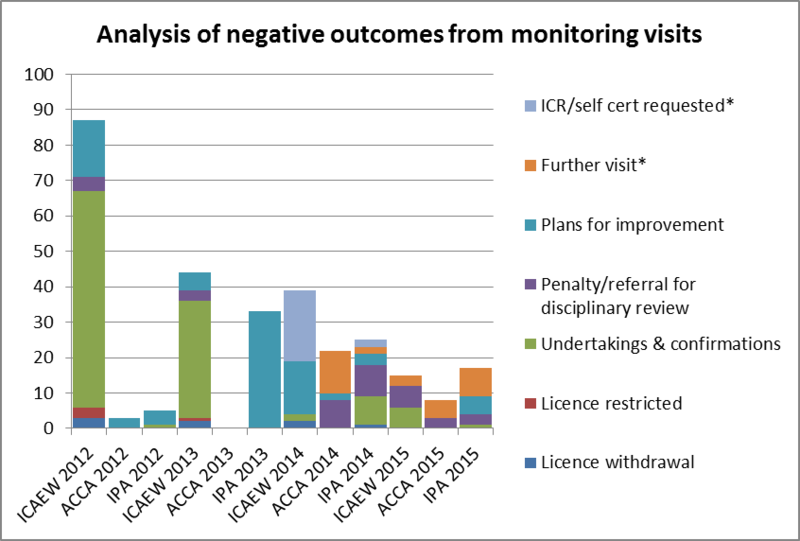 Nevertheless, it is interesting to note that almost all RPBs recorded increases in the number of negative outcomes from monitoring visits over the previous year. I am not sure why the IPA seems to have bucked the trend. It will be interesting to see how the populations of ACCA and IPA-licensed IPs fare this year, as they are now being monitored and judged by the same teams and Committees. How frequently are visits being undertaken? The Principles for Monitoring, which forms part of a memorandum of understanding (“MoU”) between the Insolvency Service and the RPBs, state that the period between monitoring visits “is not expected to significantly exceed three years but may, where satisfactory risk assessment measures are employed, extend to a period not exceeding six years”. However, most if not all the RPBs publicise that their monitoring programmes are generally on a 3-yearly cycle. If we look at each RPB’s visits for the past 3 years as a percentage of their appointment-taking licence-holders, how far off the 100% mark were they..? ICAEW’s missing of the mark is not surprising, given that they publicise that their IPs in the larger practices are on 6-year cycles. At the other end of the spectrum is the ACCA, which managed to visit all their IPs over the past 3 years and then some. However, as we know, the ACCA has relinquished its monitoring function to the IPA, so it seems unlikely that this will continue. What is the future for monitoring visits? “We propose to withdraw the MoU as soon as is reasonably feasible, subject to working through some final details”. The review goes on to explain that the Service will be adding to their existing guidance (https://goo.gl/wDHElg). As it currently stands, prescriptive requirements such as the frequency of monitoring visits is conspicuously absent from this guidance. Instead, it is largely outcomes-based and reflects the Regulator’s Code to which the Insolvency Service itself is subject and that emphasises the targeting of monitoring resources where they should be most effective at addressing priority risks. The Service itself seems to be lightening up on its own monitoring visits: the review states that, having completed their round of full monitoring visits to the RPBs, they are now moving towards a number of risk based themed reviews. If this approach filters through to the RPBs’ monitoring visits, will we see a removal of the 3-yearly standard cycle? Does the 2016 review reveal any priorities for this year? A consultation on revisions to the Code of Ethics – expected in the spring. Categories: Insolvency Service | Tags: complaints, Complaints Gateway, insolvency service, monitoring, regulation review, RPBs | Permalink. Although this is a bit of a PR statement, a couple of crafty comments have been slipped in. The newsletter explains that the Service’s “IP regulation function has been strengthened and we have raised the bar on our expectations of authorising bodies”. I started off sceptical but to be fair the Service’s summary of how it carries out its oversight function of the authorising bodies – https://www.gov.uk/government/publications/insolvency-practitioner-regulation-oversight-and-monitoring-of-authorising-bodies – does convey a more intensive Big Brother sense than the Principles for Monitoring alone had done previously. This document puts more emphasis on their risk-based assessments, desk-top monitoring and themed reviews, as well as targeting topical areas of concern, which can only help to provide a better framework in which their physical monitoring visits to the RPBs can sit. I commend the Service for establishing more intelligent regulatory processes, but two sentences of the newsletter stick in the throat: “We saw the impact that our changing expectations had in a few areas. Things deemed acceptable a few years ago were now being picked up as areas for improvement.” This is a reference to its report on the visit to its own people who monitor SoS-authorised IPs, the Insolvency Practitioner Services (“IPS”): https://www.gov.uk/government/publications/monitoring-activity-reports-of-insolvency-practitioner-authorising-bodies. Having worked in the IPA’s regulatory department from 2005 to 2012, I would like to assure readers that many of the items identified in the Service’s report on IPS have been unacceptable for many years – at least to the IPA during my time and most probably to the other RPBs (I am as certain as I can be of that without having worked at the RPBs myself). “Once a final report has been sent to the IP, there does not appear to be any process whereby the findings of the report are considered further by IPS”. Still, that’s enough of the past. The Service has now thrown down the gauntlet. I shall be pleased if they now prove they can parry and thrust with intelligence and effectiveness. Worthy of note is that the newsletter explains that, in future, sanctions handed down to IPs by the RPBs will be published on the Service’s website (presumably more contemporaneously than within its annual reviews). The minutes report that the IPA will have a final version – of what? Presumably a statutory annual report template? – within “a couple of weeks” and that two Committee members will draft a Dear IP article (there’s a novelty!) to explain that use of the standard is not mandatory. As a consequence of concerns raised by an adviser about the equity clause, DRF has agreed to “draft a response” – it seems this is only intended to go to the adviser who had written in, although it would seem to me to have wider interest – “to clarify the position, which is that a person will not be expected to go to a subprime lender and the importance of independent financial advice”. It is good to have that assurance, but what exactly does the IVA Protocol require debtors to do in relation to equity? Does the Protocol clause need revising, I wonder. I see the issue: a creditor receives dividends and then sets off mis-sold PPI compensation against their remaining debt. Consequently, it could be argued that the creditor has been overpaid a dividend and should return (some of) it. The minutes state that “it is a complicated issue and different opinions prevail” (well, there’s a revelation! ), although it has been raised with the FCA. It seems that the Committee has only just cottoned on to the fact that the Protocol does not allow the supervisor to decide whether a variation meeting should be called, so they are to look at re-wording the standard terms to “give supervisor discretion as to whether variation is appropriate so when one is called it is genuine and in these instances the supervisor will be entitled to get paid”. I’m sorry if I sound a little despairing at this, not least because of course the cynic may see this as yet another avenue for IPs to make some easy money! It was something that I’d heard about when I was at the IPA – that some IPs were struggling with IVA debtors who wanted, say, to offer a full and final settlement to the creditors that the IP was confident would be rejected by creditors, but under the Protocol terms it seemed that they had no choice but to pass the offer to creditors. I’m just surprised that this issue has not yet been resolved. Well, I’m assuming that this is what the Committee minutes refer to, anyway. Aha, so Dr Judge has been able to spin an increased number of complaints as evidence that the gateway “is meeting the aim of making the complaints process easier to understand and use”! I wonder if, had the number of complaints decreased, his message might have been that insolvency regulation had played a part in raising standards so that there were fewer causes for complaint. The report mentions that the Service is “continuing dialogue” with the SRA and Law Society of Scotland to try to get them to adopt the gateway. The Service still seems to be hung up about the effectiveness of the Insolvency Code of Ethics (as I’d mentioned in an earlier post, http://wp.me/p2FU2Z-6I) and have reported their “findings” to the JIC “to assist with its review into this area”. The report also explains that the Service has persuaded the ICAEW to modify its approach a little in relation to complaints resolved by conciliation. Now, such a complaint will still be considered in the context of any regulatory breaches committed by the IP. Years ago, the Service urged the RPBs to consider whether they could make greater use of financial compensation (or even simply requiring an IP to write an apology) in their complaints processes, but there was some resistance because it seemed that the key objective of the regulatory complaints process – to pick up IPs failing to meet standards – was at risk of getting lost: might some IPs be persuaded to agree a swift end to a complaint, if it meant that less attention would be paid to it? To be fair, this has always been an IP’s option: he can always satisfy the complainant before they ever approach the regulator. However, now settling a complaint after it has started on the Gateway path may not be the end of it for the IP, whichever RPB licenses him. I think that the stats have been more than adequately covered by other commentaries. In any event, I found it difficult to draw any real conclusions from them in isolation, but they also don’t add much to the picture presented in the Insolvency Service’s 2013 annual review. That’s not to say, however, that this report has no use; at the very least, it will serve as a reference point for the future. Ok, the complaints number has increased, but it does seem that the delayed IVA closure due to PPI refunds is an exceptional issue at the moment. Given that the IPA licenses the majority of IPs who carry out IVAs, it is not surprising therefore that the IPA has the largest referred-complaint per IP figure: 0.63, compared to 0.54 over all the authorising bodies (although the SoS is barely a whisker behind at 0.62). My personal expectation, however, is that the Insolvency Service’s being seen as being more involved in the complaints process via the Gateway alone may sustain slightly higher levels of complaints in the longer term, as perceived victims may not be so quick to assume that the RPB/IP relationship stacks the odds so heavily against them receiving a fair hearing. Categories: Insolvency Service | Tags: complaints, Complaints Gateway, insolvency service, IVA Protocol, IVA Standing Committee, monitoring, RPBs | Permalink. Have you ever wanted evidence-based answers to the following..? •	Which RPB issues the most – and which the least – sanctions? •	What are the chances that a monitoring visit by your authorising body will result in a sanction or a targeted visit? •	How frequent are monitoring visits and is there much difference between the authorising bodies? •	Do you receive more or less than the average number of complaints? •	Are there more complaints now than in recent years? 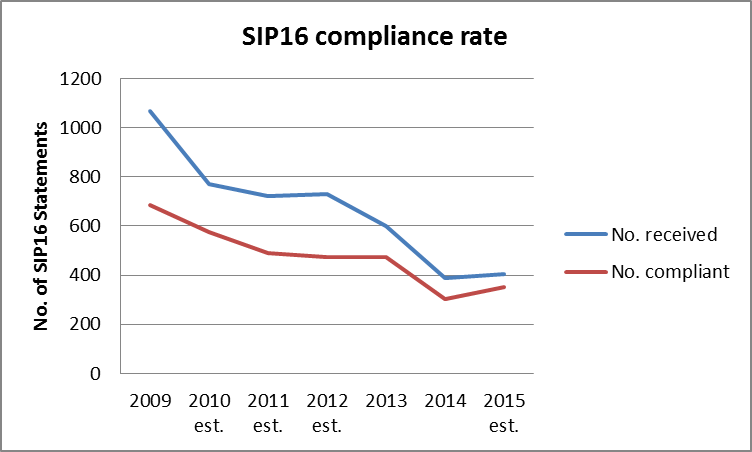 Of course, there are lies, damned lies, and statistics, but a review of the past six years of Insolvency Service reports on IP regulation provides food for thought. The Insolvency Service’s reports can be found at: http://www.bis.gov.uk/insolvency/insolvency-profession/Regulation/review-of-IP-regulation-annual-regulation-reports and my observations follow. Please note that I have excluded from my graphs the three RPBs with the smallest number of IPs, although their results have been included in the results for all the authorising bodies combined. 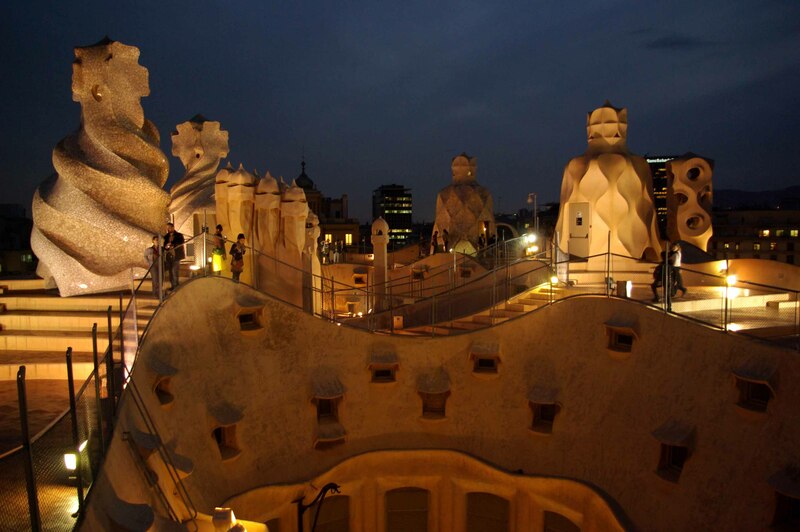 In addition, when I talk about IPs, I am looking only at appointment-taking IPs. Regrettably, I haven’t worked out how to embed my graphs within the text, so they can be found here. Alternatively, if you click on full article, you will be able to read the text along with the graphs. How frequently can IPs expect to be monitored and does it differ much depending on their authorising body? The Principles for Monitoring set out a standard of once every three years, although this can stretch to up to six yearly provided there are satisfactory risk assessment processes. The stated policy of most RPBs is to make 3-yearly visits to their IPs. But what is it in reality and how has it changed over time? Take a look at graph (i) here. This graph shows that last year all RPBs fell short of visiting one third of their IPs. However, the Secretary of State fell disastrously short, visiting only 8% of their IPs last year. I appreciate that the Secretary of State expects to relinquish all authorisations as a consequence of the Deregulation Bill, but this gives me the impression that they have given up already. Personally, I would expect the oversight regulator to set a better example! Generally-speaking, all the RPBs are pretty-much in the same range, although the recent downward trend in monitoring visits for all of them is interesting; perhaps it illustrates that last year the RPBs’ monitoring teams’ time was diverted elsewhere. Fortunately, the longer term trend is still on the up. What outcomes can be expected? The Insolvency Service reports detail the various sanctions ranging from recommendations for improvements to licence withdrawals. I have amalgamated the figures for all these sanctions for graph (ii) here. Hmm… I’m not sure that helps much. 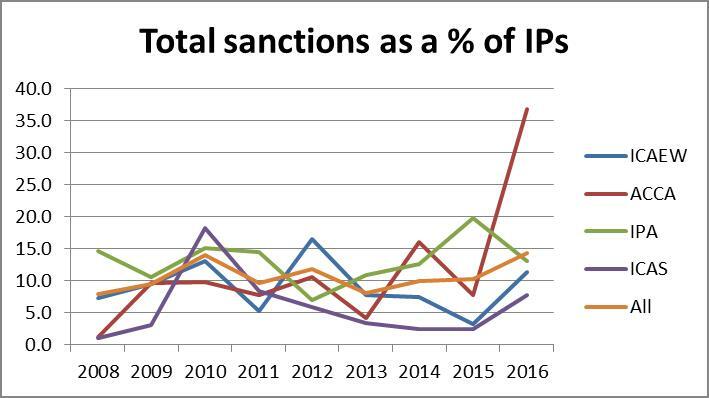 How about comparing the sanctions to the number of IPs (graph (iii) here). That’s not a lot better. Oh well. Firstly, I notice that the IPA has bucked the recent downward trend of sanctions issued by all other licensing bodies, although the longer term trend for the bodies combined is remarkably steady. I thought it was a bit misleading for the Service report to state that “the only sanction available to the SoS is to withdraw an authorisation”, as that certainly hadn’t been the case in previous years: as this shows, in fact the SoS gave out proportionately more sanctions (mostly plans for improvements) than any of the RPBs in 2009, 2010 and 2011. 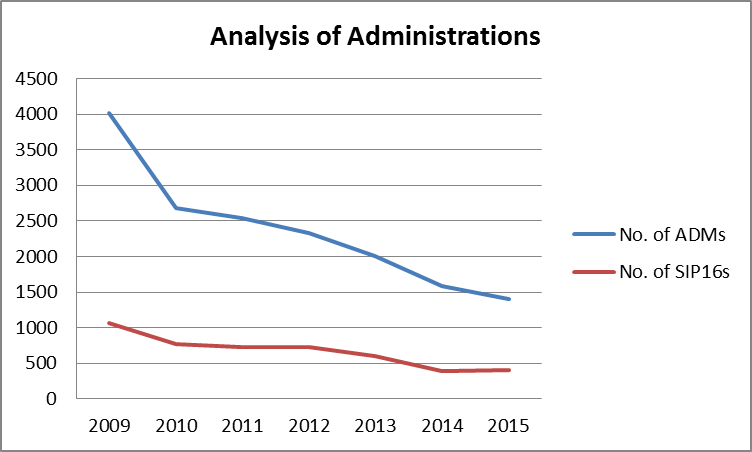 Although ACCA and ICAS haven’t conducted a large number of visits (30 and 25 respectively in 2013), it is still a little surprising to see that their sanctions, like the SoS’, have dropped to nil. However, the above graphs don’t include targeted visits. These are shown on graph (iv) here. Ahh, so this is where those bodies’ efforts seem to be targeted. Even so, the SoS’ activities seem quite singular: are they using targeted visits as a way of compensating for the absence of power to impose other sanctions? 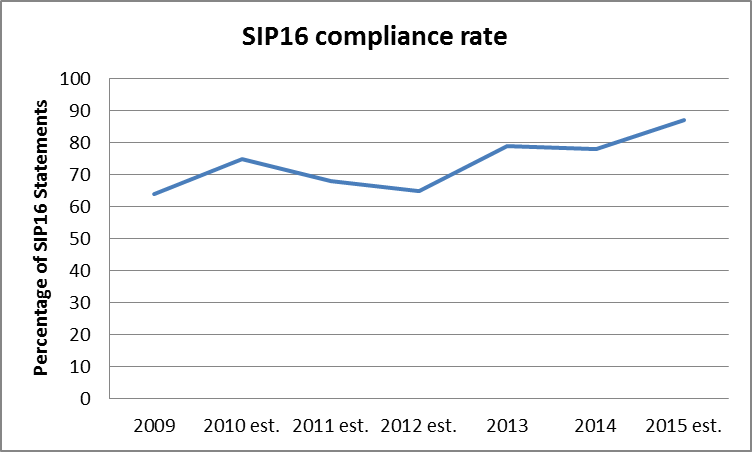 The Insolvency Service’s report includes a graph illustrating that the number of complaints received has increased by 45% over the past three years, with 33% of that increase occurring over the past year. My first thought was that perhaps the Insolvency Service’s Complaints Gateway is admitting more complaints into the process, but the report had mentioned that 22% had been turned away, which I thought demonstrated that the Service’s filtering process was working reasonably well. Therefore, I decided to look at the longer term trend (note that the number of IPs has crept up pretty insignificantly over these six years: a minimum of 1,275 in 2008 and a maximum of 1,355 in 2014). Take a look at graph (v) here. So the current level of complaints isn’t unprecedented, although why they should be so high at present (or indeed in 2008), I’m not sure. It also appears from this that the IPA has more than its fair share, although the number of IPA-licensed IPs has been growing also. Let’s look at the spread of complaints over the authorising bodies when compared with their share of IPs (graph (vi) here). Moving on to complaints outcomes: how many complaints have resulted in a sanction and have the RPBs “performed” differently? Have a look at graph (vii) here. At first glance, I thought that this peak reflected the fact that fewer complaints had been received – maybe the actual number of sanctions has remained constant? – so I thought I would look at the actual numbers (graph (viii) here). Hmm… no, it really does look like the number of sanctions increased in years when fewer complaints were lodged. However, I’m sceptical of this apparent link, as I would suggest that, in view of the time it takes to get a complaint through the system, it may well be the case that the 2012/13 drop in sanctions flowed from the 2010/11 reduction in complaints lodged. I shall be interested to see if the number of sanctions pick up again in 2014. Going back to the previous graph, personally I am reassured by the knowledge that in 2013 the RPBs generally reported a similar percentage of sanctions… well, at least closer than they were in 2010 when they ranged from 2% (ICAEW) to 38% (ICAS). The ICAEW’s record of complaints sanctions seems to have kept to a consistently low level. However, let’s see what happens when we combine all sanctions – those arising from complaints and monitoring visits, as well as the ordering of targeted visits (graph (ix) here). Hmm… that evens out some of the variation. Even the SoS now falls within the range! Of course, this doesn’t attribute any weights to the variety of sanctions, but I think it helps answer those who allege that some authorising bodies are a “lighter touch” than others, although I guess the sceptic could counter that by saying that this illustrates that IPs are still more than twice as likely to receive a sanction from the IPA than from ICAS. Ho hum. 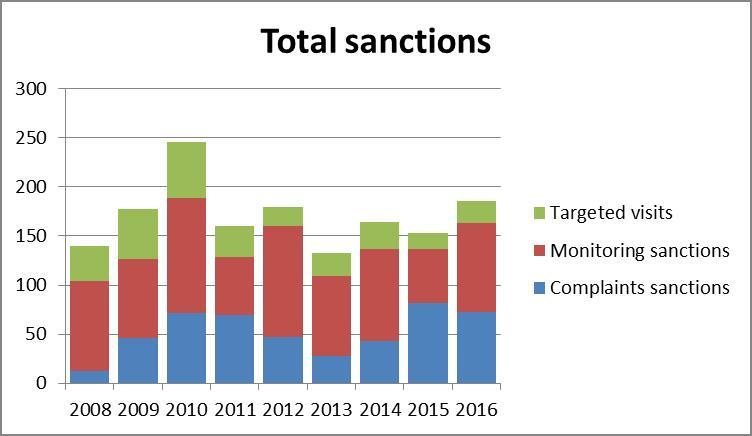 To round things off, here is a summary of all the sanctions handed out by all the authorising bodies over the years (graph (x) here). This suggests to me that targeted visits seem to have gone out of fashion, despite monitoring visits generally giving rise to more sanctions than complaints… but, with the hike in complaints lodged last year, perhaps I should not speak too soon. Categories: Insolvency Service | Tags: complaints, insolvency service, IP regulation, monitoring, RPBs, sanctions | Permalink.